Adobe has announced the immediate availability of their EchoSign app in the Apple App Store. EchoSign provides users with powerful new ways to request and collect digital signatures on their iPads and iPhones. The new app lets you send out a document for an eSignature, manage and track the status of signature requests in real-time, and even have people sign your device when you “happen to” bump in to them. Seen as a necessary step on the path to the paperless office, Adobe is one of several companies vying to create eSignature ecosystems that let you handle electronic signatures in a manner that is legally binding. That would allows contracts to be finished as easily as other forms of electronic communication, saving time and money (not to mention trees) compared to the common practice of mailing a contract out via certified mail, physically signing a document, and sending it back. 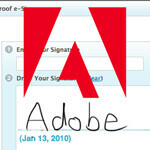 Adobe was a bit late to the eSignature game, but purchased EchoSign this summer to play catch up. The Adobe Acrobat Blog indicates that mobile apps are just one step in making EchoSign widely available; Adobe plans to integrate EchoSign technology into their mobile Acrobat Reader as well, which will dramatically increase customer uptake. No mention was made of Android or Windows Phone versions of the app, but given the importance Adobe is placing on EchoSign it's probably just be a matter of time before the app is available on all the major mobile platforms.